Named in the Sunday Times Top 100 Restaurants in Britain for 2015-16, this stunning restaurant from celebrity chef James Martin is a real highlight of the Manchester235 Casino. Set away from the main gaming floor on its own mezzanine level, but very much an integral part of our casino, this spectacular restaurant offers the finest fresh, local cuisine in all of Manchester. Perfect for any occasion! James Martin, well known and loved for his cookery shows on the BBC and Channel 4, produces classic, seasonally changing à la carte menus, special menus and traditional Sunday lunch of the highest quality. These include some of his tried and tested favourites, alongside exciting new dishes – all using the finest local produce. A glance down the menu is a mouth-watering prospect. Unique starter options include Cumbrian venison tartare and Thai crab risotto, while for mains there’s everything from salt-aged duck to rabbit loin. Then, why not finish things off with our celebrated hot sticky toffee pudding? In a novel twist, the restaurant even features its own Meat Market – a walk-in fridge displaying the different cuts of local meat maturing before your eyes, before being cut and served. All steaks are aged for a minimum of 28 days. Guests will be wowed by the restaurant’s stylish decor. Combining industrial-chic girders with natural daylight and James’s own selection of luxury vintage-style fabrics and artwork, it all makes for an incredible dining experience. For an exclusive, luxury private dining experience, why not book our chef’s table, sectioned off from the rest of the diners. We can prepare a special menu for up to 10 guests or create a bespoke menu, explaining each course as it arrives. T&Cs: Chef's table menu cannot be booked online. This menu must be booked at least one week in advance and full pre-payment is required to confirm the booking. For chef's table booking enquiries, please contact our restaurant team. You might even be lucky enough to see James Martin himself, as he makes regular appearances at the restaurant throughout the year, and hosts special events where he cooks a selection of courses and takes your questions. You’ll need to book quickly though as places fill up fast. We recommend booking in advance to guarantee a table. 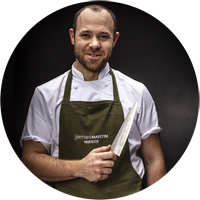 James Martin Manchester is proud to be part of the Food for Thought programme. Just 99p added to your bill buys a tree to offset the carbon footprint of your meal. So far, your generous contributions have allowed Manchester235 to be able to buy an amazing 16,472 trees. You too can help by allowing us to add 99p to your table's bill. Please note, the full 99p is passed directly to Food for Thought. The Food for Thought programme, operated by the Green Earth Appeal in partnership with the United Nations Environment Programme, does so much more. It helps provide education and resources to create a sustainable lifestyle in some of the poorest communities on the planet. Find out more about the Green Earth Appeal and Green Apple Awards here. Our best chefs and bartenders have been busy preparing for our annual competition, where teams from all our UK Total Rewards casinos come together to compete for the top spot. Watch the video below for the day's highlights, including the winners.